Bunil Weaving, an age-old tradition of the women of Poona Piagapo, Lanao del Norte experienced recognition for the first time during the Kahimunan Trade Fair Food and Lifestyle Show in Cagayan de Oro City. During its first time participation in a regional trade fair, it was recognized as one of the nominees for the Best Product Design. Bunil Weaving is an age-old tradition of the women of Poona Piagapo. It is not only a matter of exertion of labor into the task, but it is in weaving each strand that they are able to entwine and uphold their dreams of a better life for their children and their family as a whole. It is in putting each strand together that forms the totality of the product and it is in the product that the women of Poona Piagapo are able to promote boldly their identity and their rich Maranao culture. Mothers and daughters alike learn the craft not only as a necessary source of revenue to support their daily needs but also as a vivid expression of their love of one’s culture. It is in the play of bright colors that one is able to mesh their persona with the identity of the group. And it is in the association of oneself with the culture that one is able to define one’s self! Bunil are soft, fine, yarn-like materials which come in varied bright colors. The design and play of colors are the result of the artistic conception of the minds of the Maranao weavers. 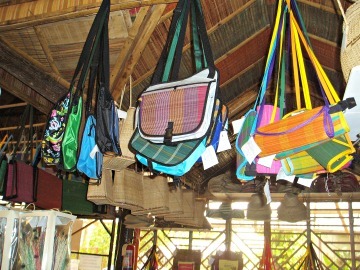 Products come in different forms and functionality such as: Langkit, strands of woven bunil crafted with designs which may be perfectly utilized as linings and accents for other functional fashion items such as bags, Filipino clothing, necklaces and other like items; Bunil Blanket, well described as fertility blankets which may be especially attributed to its fine weaving and warm material. Newlywed couples or couples who want to welcome an addition to the family could best use this for their intimate moments. This may be best used if it is already prayed for blessings by an Imam; Lei, Carefully and artistically handcrafted product, these may function as lei for VIPs who visit the place noting that it is a precious representation of the place which exudes the culture; Table runners and place mats, bright colors would make the table presentation more desirable and served food more enticing. The table runners and place mats made out of bunil may best as a regular fare on the table; and Bunil bags which come in different sizes and styles would definitely easily blend in with the kind of fashion statement the bearer may want to exude. To and fro the municipal hall, the association leaders gather to prepare for the big day. With numerous ideas in mind, each suggested what to do and what to prepare. The excitement sank in deep that everyone would want a piece of their mind written on the application form, and everyone would want to be present during the big day. Disabled by the financial constraints, everyone went in prayers and high hopes to the four representative of the association to the Kahimunan 2014 Regional Trade Fair. The association made their initial step through participation in an SME Roving Academy conducted by the Department of Trade and Industry (DTI) Lanao del Norte Office at Zoe’s Café, Iligan City. Things to be learned about the trade fair were imparted during the training and the participants skills were beefed up. The products marketability was even more testified because during the training, other participants were buying the product. The four representatives of Poona Piagapo did not mind and painstakingly endured the more than 50 kilometre trip to Cagayan de Oro City. To prepare for the big day, the participants had a feel of the environment the night before the start of the trade fair proper at the hallways of SM Cagayan de Oro City. The clocked ticked 6:00 a.m. and all the decorations were up. All the inventory were out and were arranged well, ready for sale! Each of the exhibitors beautified and lighted their spaces to maximize the product presentation and made sure that the judges would take a look at their products and earn their attention. Of the hundreds of products presented, Hand-woven bunil caught not only the attention of the buyers but that of the judges as well. Poona’s Finest hand-woven bunil made P24,250.00 in sales during seven days of the exhibit! Since time immemorial, this was an event worth reminiscing, for this was their first time to make this amount of sales in just a short span of time.